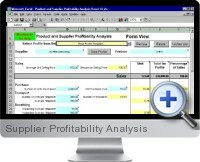 Supplier Profitability Analysis for Excel determines the profit by product and supplier for a business. Product and Supplier Profitability for Excel allows the identification of the true costs associated with supply chain driven products. It does this by considering the initial costs (purchase, transport, receiving, and reject), ongoing costs (storage and overheads), as well as financing and customer return costs. Supplier Profitability Analysis for Excel calculations are presented in both Form and Table view for effective display. Supplier/Product profiles are created in Form view and cost analysis by unit and profile are applied. Sensitivity functions allow the testing of variations for Stock turn and Customer Returns. Each profile can be saved to the Table view providing a database of profiles with Sub Totals by supplier and calculations for the Total Business. Supplier Profitability Analysis for Excel allows the set up of standard profiles.